Gonzaga is in the mix for North Dakota graduate transfer Geno Crandall. Crandall is expected to visit Gonzaga’s campus next weekend, according to CBS Sports’ Jon Rothstein. The 6-foot-4 guard will first visit Xavier this weekend and Colorado State next week. The Zags are well aware of Crandall, who made four 3-pointers and poured in 28 points in an 89-83 overtime loss to Gonzaga at the McCarthey Athletic Center in December. Crandall also had five assists, three steals and seven turnovers while playing all 45 minutes. 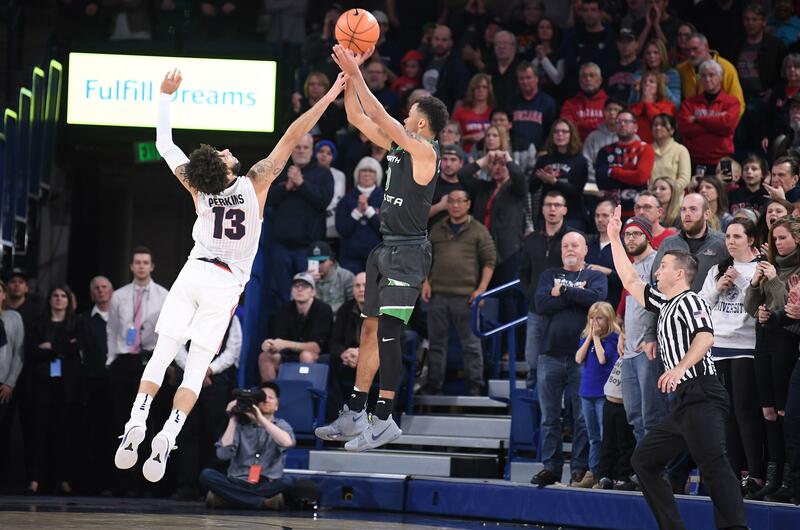 North Dakota, 30-point underdogs, led by eight with 4 minutes left in regulation before the Zags rallied behind Josh Perkins and Zach Norvell Jr.
Crandall would be an intriguing addition to a Zags team projected in the top five in numerous preseason polls. Gonzaga could use an additional ball-handler, playmaker and 3-point threat. Crandall checks all of those boxes. Crandall is also experienced with 90 starts in three seasons at North Dakota. Crandall averaged 16.6 points, 4.3 rebounds and 3.6 assists last season. He made 42 percent of his 3-point attempts. His career averages are 14.3 points and 36.7 percent beyond the arc. Crandall also expressed interest in New Mexico State and Minnesota shortly after he announced he was leaving North Dakota. Towson’s Zane Martin, a 6-4 guard who averaged nearly 20 points per game last year as a sophomore, is scheduled to visit Gonzaga this weekend. Martin will be required to sit out one season under transfer rules and then have two years of eligibility. Published: June 20, 2018, 5:27 p.m. Updated: June 20, 2018, 6:21 p.m.